Positive Research Results for WriteSteps! A study from the Harvard Educational Review links writing practice to the development of strong reading skills. It confirms what teachers have known all along — that the more students write, the better they read. That being said, many students are not skilled readers or writers by the end of their K-12 careers. The 2009 National Assessment of Educational Progress reported only 33% of fourth grade students performed at or above the “proficient” level. By the time students reach the twelfth-grade, the percentage is only 38%. How can we change this percentage? Graham and Herbert say that many students in many classrooms do not write frequently enough. Teachers emphasize the importance of reading in today’s world, with contexts that include widely ranging text types: Facebook posts, instructions on bottles of medicine, and legal documents, not to mention an overwhelming array of websites. But they don’t spend enough time focusing on the writing aspect. I believe teaching reading as a primary focus in the classroom is a disservice to writing. Lets’ make sure not to put the cart before the horse. Learning to read is extremely important, but teaching proper writing skills will support students’ overall understanding of reading. The long term result will be worth it- providing a strong writing foundation will ultimately improve your students’ reading capabilities and furnish them with the tools necessary to reach their fullest potentials! Students that learn to write well also have higher comprehension across all subject areas. It is very important to teach writing as a whole across all subject areas. One of the most challenging tasks a teacher faces is writing instruction. I know because I have been challenged by this! This is also why I feel writing instruction is placed on the backburner in the classroom. If you are struggling, please don’t be discouraged. I’m here to help you. 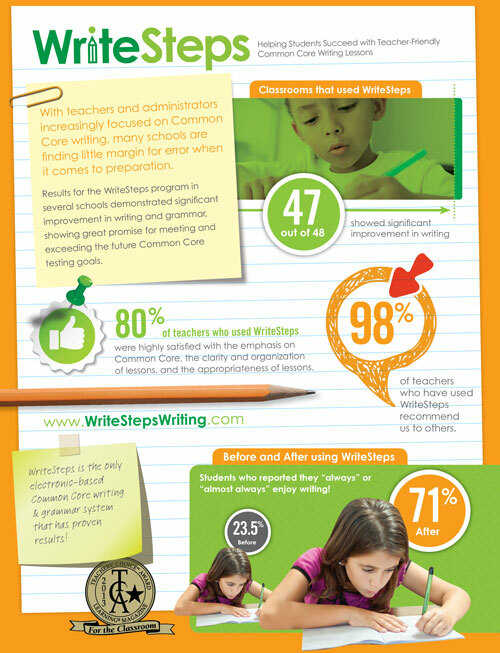 WriteSteps offers a pathway to success with K-5 writing and grammar instruction with proven results. We are the only award-winning, digital and print, research-based, K-5 Common Core writing and grammar program on the market today. We offer a strong foundation with flexibility for teachers. It has always been my passion to make a difference in the lives of the educational successes of as many students as I can. It is the reason why I chose to leave my teaching career behind to begin WriteSteps. Rather than reaching one classroom a year, I have the ability to help thousands of teachers and students in classrooms all over the United States. Last month we shared the results of our independent research study showing significant improvement in students’ writing skills in 47 of the 48 classes that participated! Check out the picture below for a detailed visual of the results from our August study! WriteSteps Welcomes Anjilla Young to the Team! WriteSteps is happy to welcome our new Communications Specialist, Anjilla Young, to the team! Anjilla brings a wide range of experience in public relations and communications to the table and we are pleased to have her on board. Anjilla’s role at WriteSteps is to provide content for our e-Newsletter, blog, and press releases. She will be communicating the WriteSteps mission to our fans. Anjilla’s previous experience includes working for a group of southeast Michigan schools where she handled their public relations and communications while increasing the schools’ presence in the communities they were located. WriteSteps Communication Specialist Anjilla Young with her horse MA Revival of Love. Prior to her education industry experience, Anjilla was an Associate at Lambert, Edwards & Associates, one of the Midwest’s largest and most respected public relations and investor relations firms. Here she gained a variety of PR experience across a range of industries. Anjilla says her internship at the Detroit Symphony Orchestra, prior to LE&A, was a key factor in her decision to pursue a career in the communications/public relations industry. Anjilla graduated from Michigan State University with a Bachelor of Arts degree in advertising. During her time at MSU she had the opportunity to live and study abroad in Sydney, Australia for one year. “My study abroad experience is something I will never forget,” Anjilla recalls. “I know I won’t have the opportunity to live in a different country again. It truly was an amazing experience and shaped who I am today.” Anjilla strongly recommends to anyone that is considering a study abroad program to go for it! Besides work and family, Anjilla’s passions are horseback riding and travelling. 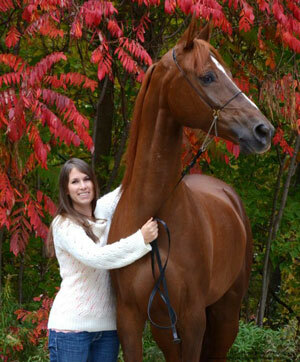 She has competed at the national level, earning top ten equestrian titles in both the United States and Canada. Anjilla has been showing Arabian horses her entire life and owns a Half-Arabian named MA Revival of Love. Next year she plans on competing at nationals with him. Anjilla is joining the team at WriteSteps during an exciting time, where she will be growing with us, while at the same time, growing us! We have a busy few weeks sharing insights on K-5 writing and grammar for the Common Core in Jefferson City, Boston, and Detroit! If you are in the area make sure to stop by and say hello to the WriteSteps team! We’ll be holding drawings for lessons too, so come see us and register to win! WriteSteps Founder & CEO Suzanne Klein will host a workshop titled, “Preparing for the Common Core State Standards”, at the Missouri Association of Elementary School Principals, building in Jefferson City, Missouri. Awareness Ambassador, Nicole Simms, will exhibit at the Northeast Association of Supervision & Curriculum Development Regional Conference, located at the Boston Park Plaza Hotel & Towers. WriteSteps Founder & CEO Suzanne Klein will present “Ready, Test, Score! Essential Tools for Common Core Writing Success” at the Michigan Elementary and Middle School Principals Association Annual Exhibit Show at the Detroit Renaissance Center. Catch her talk at 9:00 a.m.